NEW YORK (October 18, 2013) – The 3rd Annual Halloween Pups on the Runway, to benefit The Sato Project, will be presented in New York City on Friday, October 25 from 6pm to 9pm at Toyota of Manhattan, located at 645 11th Avenue, New York, NY 10036. The Halloween Haunted House will include spooky treats, musings by Madrette the pet psychic, followed by the Canine Costume Contest to feature costumes in categories such as: Glamour, Hilarious and Matching Pawrent. Famed Fashion Dog Designers and Celebrity Guests will be the judges for the Costume Runway Contest for fantastic prizes. A portion of the proceeds from the independently produced Halloween Costume Ball, by Pups on The Runway will benefit The Sato Project. 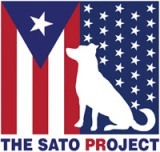 The Sato Project is a non-profit, 501(c)(3) organization dedicated to rescuing abandoned and abused animals from Puerto Rico. They primarily work on Dead Dog Beach, an infamous dumping ground where dogs are abandoned and abused on a daily basis. The volunteers of The Sato Project are the only source of food, fresh water, and love for the dogs of Dead Dog Beach. Since its inception in November 2011, The Sato Project has rescued, vetted, rehabilitated and adopted out over 500 of these dogs. Every dog averages $800 in vet’s bills before it travels to the US to meet its forever family. The volunteer-based organization operates on donations only. They opened their first sanctuary in Boston during the Summer 2013. You can find them at http://thesatoproject.org/.